also, I'm not sure if it is discussed in the threads Aura pointed out above but never blow out your candles. It signifies the end of the spell. You will have to snuff them out if you choose to extinguish them while you are not home. I suggest that you use 6 inch candles dressed with the appropriate oil. They burn in about 6 hours. You can always burn 4 inch candles also; they burn in about 2 hours. The jumbo candles burn in about 24-30 hours and are nice to use as a mini-vigil. Thank you everybody! I had done a search but must not have used the right key words. I'll check out the links you suggested. Thanks everyone! I burn a lot of candles in the process of using them and I've started to notice some soot build-up in my house over the years. Does anyone else have this issue and if so may I ask how you deal with it? I don't know anyone else who burns candles quite as regularly as I do, so no one I know seems to have this problem to the extent I do. Any answers are greatly appreciated! That soot is also referred to as candlesmoke. We will get a small buildup of it on our walls every year or so. We wash the walls and ceiling with a scrubbing ammonia spray and then give them a fresh coat of white paint. Thank you for the answer-I've been scrubbing all day and it amazing where that soot can get! Anyway, I'm dealing with drywall and a textured plaster ceiling, neither of which handles contact with water well. I guess re-painting is the answer. Just curious how others dealt with this problem. I have to agree with Mama Micki on this one. A burning candle inside of a stove does not sound like a good idea make, especially when talking about a gas stove. Besides, I figure that with such an enclosed and small space, the flame won't have much oxygen to continue the burn anyways. Plus, with the candle bring out of sight, its easy to forget. Also, the fact that someone's cat knocked it over does not necessarily have anything to to with the spellwork. Cats are curious and inquisitive by nature, and as a pet owner, the necessary precautions with consideration to the cat was not taken into consideration. If a cat can't leave candles alone, burn them in a room with the door shut. I have two cats. One gets into everything and one is content to just lay on my bed, so the first cat is not allowed in my bedroom, where he would destroy my altar if I let him. I agree. Our altar room is now completely off limits to our two beloved cats. Too many candles burning, just asking to be knocked over. In the case of free burning candles (not vigils) too great a chance of burning whiskers and fur. Also, the cats love to get into bones, feathers, and other animal curios. Published: Thursday, February 23, 2012 at 1:30 p.m.
Last Modified: Thursday, February 23, 2012 at 1:30 p.m.
A woman on Kentucky Street [in Petaluma, California] who reported a fire said she was “blessing” her house with a burning container of rum and bath salts when the flames spread to a hanging bathroom towel. By the time firefighters arrived, on Feb. 20, she had extinguished the towel. The responding firefighters investigated the bathroom door and surrounding area and found no fire but some charring on the back of the door, according to a report of the incident. Firefighters deemed the fire accidental. Don't let it happen to you! Be careful! So, I came home from work one day and decided to make a money altar. I take an old endtable cover with my daughter's stickers and print pictures of one hundred dollar bills and other bill denominations and tape it to the top of the table completely covering it. They stayed lit for moment... but since I had the three candles so close to the incense the heat (I'm assuming made them soft) and they started to fall over, getting the wax everywhere, and they were still lit! I didnt want to have to blow them out, but I didnt want to burn my house down either so I snuffed two of them out because they kept falling over after I stood them back up over and over, and the one I kept lit put it in a slightly larger candle holder. My jar candles are still lit as I type, and the lone lucky mojo candle with my name carved is still burning away along with the incense. I left the other two unused candles on the alter..
Oh gosh, i put too much incense, now my room is full of smoke....time to turn on the fans.. JEEZ. What ya think, my altar should still be functioning for what I want it to do, yeah? I'm going to go back to what a hair dresser once said to me, "Honey if it burns your hand, it burns your hair"! Many people have fiascos that are not always shared . So, be careful, and it sounds like you are getting a great start, and Hooray that you are working a money alter!!!$$$!!! Do not hold pictures, lotto tickets (especially )so close to the flame.. smoking them is enough. Simplify your altar. It appears that you had too much stuff in too small a space. I'd suggest that you order a dressed vigil candle from Lucky Mojo; Money Drawing, Lucky 13, Fast Luck, Black Cat, or Lady Luck might be appropriate. If you do use freestanding candles, make sure they are in a metal candleholder or in a dish of sand, dirt, or salt, so they don't tip over. I have ammonia'd, carved, herb'd, oil'd, prayed, petitioned and then lit my vigil candle and placed it on my money altar. I have the petiton paper oiled and folded underneath the candle. When I leave the house, to keep my candle burning, I place it in the tub, paper underneath it still. Do you think by constantly moving my candle back and forth from the altar to the bathtub will affect the spell? I also should mention when the candle is transitioning, I always hold the petition paper underneath it so i don't have to slide it under after setting the candle down bathtub or altar, along with walking slowly as not to disturb the wax or flame. No, I wouldn't worry about it jadejenova. jadejenova: I, too, do this as needed, and have found that it did not effect my results! Best of luck to you and your work. I am curious if there is an alternative to burning candles in rituals and spells. The reason I ask is because some spells ask that you leave candles burning for long periods of time and I am paranoid of fire damage. I have animals too. Is it possible to symbolically burn a candle. Just looking at alternati es that would work. Many of us (including me) have pets that we don't want to hurt with fire or candles. There are many ways you can work around that. 1. Put your glass vigils in a shallow pan that has about an inch of clean sand or salt in it. The sand absorbs the heat. Put the pan up on the counter where the animals can't get it. This is what I do to keep my cats away from the candles. 2. Burn a free standing (ie., not glass encased) light in segments over a period of days. This is a very traditional way to work in hoodoo. You light the candle and let it burn for about 15 minutes then snuff it out. Repeat daily for 7 days, and on the last day you let it burn all the way out, thus completing your spell. 3. You can set a candle in your shower stall or sink. But no, there is no such thing as symbolically burning a candle. You either light a candle or you don't. ...or you can burn 15, 30, one hour at a time while you are in the vicinity. This keeps heat on the situation and works in your favor as well. Alternatively, I would follow Mary Bee's item #4. Another alternative is to work with an oil lamp: LM even sells them fixed and ready to go. They can carry the heat for an intention and are considered a safer vehicle by many. You can burn 4 inch candles. They are usually done in less than two hours. Another alternative is to take the same materials you would use to load a candle -- personal concerns, herbs and so forth -- make a nice little packet of them, and bury them under a plant (yes, even in a flowerpot). This not only eliminates fire danger, but also sets you up for long-term, constant energy applied to your work, and conceals your work from prying eyes. This is a good technique to know. Thank you. Thank you very much for the reference, miss cat. so I have my little ater going with a candle burning on a honey jar, a doll of my ex who i want to reconcile with/command and other tea lights and candles around it. I dosed of for a minute and then woke to a big flame (yes i know there are always safety warnings with these spells to prevent this), on the doll's head and the picture of my guy. The picture burned around the outline of his head but the doll was not lucky at all, it lost the head and one shoulder and part of one arm. I wouldnt say its a sign, i mean i was obviously careless leaning it so close to the candle on the honey jar, but i wonder if i hurt him in this accident. How should I cleanse? or just keep going with the picture or a new doll? If you baptized that doll baby as your ex, and were working with it as a direct proxy for him, and then the head and arm got burned with the fire from your honey jar work...I would say that is most definitely a sign of something. I agree with the previous posters. You want to get a reading because you want to be sure this is just a careless mistake. I recently lit a 6 inch purple candle dressed with Power oil (while reciting the 23rd psalm) in a glass candlestick. By the time it had burnt down completely, part of the candlestick had broken, which I read is a bad sign when you are trying to increase something. However, there was also no remaining wax, which I read is a good sign. Perhaps I should just take it as a lesson in fire safety and not use glass holders from now on? If you burn freestanding candles, use a metal candle holder, so it is safe to burn them all the way down. I certainly shall from now on. Thank you! It can be a sign or it can be a matter of physics, when a candle flame burns a candle holder making it so hot it shatters. Id re-burn in a candle holder made specific for this and see what happens. My question is about the Love Me vigil candle that Lucky Mojo sells. I purchased one several weeks ago and lit it tonight. The herbs on the candle caught on fire soon after I lit the wick, resulting in several flames on the candle surface. I pushed the herbs away from the wick and the flames extinguished, only the candle wick is burning. But as a result there are several burnt herbs in the wax now. Because I do not know what are the herbs used in the Love me candle, I would like to ask if the herbs catching fire is normal in the context of the herbs used in the Love Me vigil candle? I want to ask, how safe are vigil glass encased candles? Like, how well does the glass do with heat? I'm asking because I'm burning a Road Opener and it's burning VERY well, an inch to an inch and a half tall flame, even after I trimmed the wick down to almost nothing. When I go to school, I usually put my candles in a metal pot over a metal cookie pan, and either fill the pot with water or sand. I've never had a problem. However, this candle is kinda worrying me, because I've never had such a lively flame before. I can't put it in the bathtub or oven because I'm forced to do my spellwork in secret. Vigil candles are made to burn continuously, and as long as it is not disturbed, it should be fine, especially since you are putting it in a container of water or sand. Should I leave the candles steadily lit? Also - how many should I "work" at one time? This is actually very common. Whenever I light a Vigil Candle, I always watch it for a few minutes. Having something to move the herbs is a must. I usually use a nail. Also, try not to analyze the Candle as it Burns. This will just drive you crazy. In my opinion, the best approach with Vigil Candles is to Light them, and let them be until they are done. Always be mindful of fire safety! Make sure they are in a safe place. Never leave a Candle unattended on the Altar. It may seem that it is a good thing to have them on the altar for the purpose of the spell, but there are a lot of cases of Altars going up in flames from candles left to burn on them. Bath Tubs and Fire Places are the best for leaving Candles to burn. As I stated in my previous post. It is best to Light a Vigil Candle and let it be until it goes out on its own, but be mindful of Fire Safety! As far as, "How many at one time" that is up to you, as the worker. You don't want to be going in two directions at once, though. For instance, I would not do Break-Up at the same time as Return to Me. Too many wires to cross. For the sake of the potency of the Magick, focus on one Goal at a time. Make the intention clear, and keep faith. The power is in your belief, and you want to have that focused and best as possible. A second way to approach the topic that Apollo Dark mentioned is to burn candles for both sides of a question (e.g. break up versus return of a lover) on two separate altars. We do this all the time at Missionary Independent Spiritual Church. A third option is to burn the negative candles or candles of removal as the moon wanes and the positive candles or candles of increase as the moon waxes. A fourth option is to burn both on the same altar that faces South, with the positive candles at the East and the negative candles at the West. All of these methods -- in addition to Apollo's "burn one at a time advice" are traditional and favoured methods. The point is, your work should have some thought behind it, some methodology, and it is up to you to plan your layout. See the thread on altars in this forum for much, much more information. I was burning a red candle for a love spell, dressed with Come to Me oil. I put it in a plastic candle holder because I couldn't find a traditional one around the house. The candle burned EXTREMELY fast, faster than I could notice, and started to melt into the plastic holder, causing a little fire. I put it out, but the candlewax melted into the plastic and all... Nonetheless, I buried everything in my front yard. Will this affect the spell at all? The plastic being melted into the wax? =/ I'm worried about this. Should I redo the spell? Do it over. Use a metal candle holder; I've never seen a plastic one. You're lucky you didn't burn your house down. Mama Micki wrote: Do it over. Use a metal candle holder; I've never seen a plastic one. You're lucky you didn't burn your house down. I concur. You are very lucky. Do it again, and this time make sure it is FIRE SAFE! Whenever I can't find a candle holder, I light a match under the base of the candle and melt a little wax off it onto a saucer; then jam it into the melted wax. You can also buy little boxes or jars of "tacky wax" at craft stores, just for sticking candles into holders that aren't quite the right size. I live in an apartment where I am not allowed to light any candles/open fires. Is there an alternative to lighting a candle? Could I maybe use an electric candle or batterty operated candle, put some paint on it to have different colors? This is so sad. You think hoodoo is all about candles... you can't light a candle so you think you can do magic by painting an electric candle some colour. No, sweetheart, that's not what this is about at all. 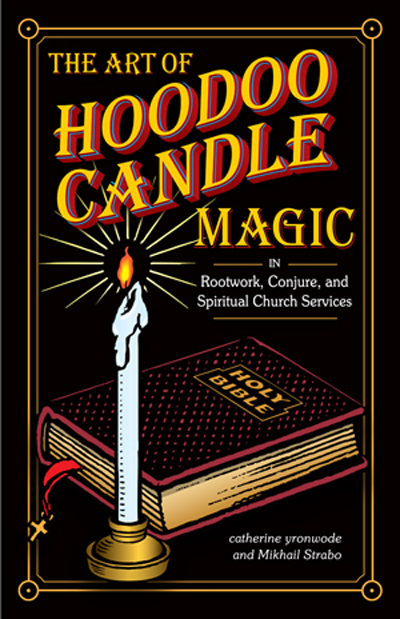 First off, candle burning as a form of magic is one of the later developments in hoodoo. It came after incense, after bathing and floorwashing, after wearing scented perfumes and oils, after the carrying of roots and minerals, and the making of packets and bundles. Start by reading about the history of hoodoo. It is not all about candles. It is all about African American folk-magic. Whenever you see a link in that article that is new to you, click it, read the descriptive page, and come back to the article. That should get you started, okay? I am ready to come clean regarding my own stupidity and candle burning. I read here on the forum that to melt some of the wax on a honey jar you can pour a little Florida water and light it so that the wax will melt. Well i did just that in the bathroom. But to be super safe I placed the honey jar inside a tin foil pan. I usually use these pans to burn incense, candles etc. There was residue at the bottom of the pan but I was too lazy to clean it , thinking it would not be an issue and after all I was CLEANING up not actually doing work !! Well (deep breath)..whatever it was , as soon as the flames hit it , it produced a huge ferocious flame ! !I was pertrified!! I poured a little water to try and douse it, Thank God it was only a small amount because it was as if I added oil to the fire !! Now the pan fire was HUGE!! with flames licking the mirror and sink!!. I was afraid to touch or move the pan. in my panic, there was some clarity in that I got more foil pans and layered them over the original pan to SMOTHER the fire out. It took a while but it eventually calmed down. In the meantime the honey jar is still in the pan and the honey began to BOIL and BUBBLE over and out of the jar !! ONE HUGE MESS!! It took a good hour before everything was extinguished. The Honey jar was completely black with black honey inside. On one hand I know its not a good sign and on the other I was not actively working the honey jar. So I dispose of everything in the trash and started a new honey jar. Sooo...the moral of the story is .....do not be careless, reckless and lazy like me, I could have literally caused the whole apartment to burn down. BlakPrincessUK, thank you for sharing the life lesson! That shows courage. Folks, remember that Florida Water is an alcohol-based perfume -- that means FLAMMABLE. Also, alcohol + oil = Molotov cocktail -- a homemade bomb! BlakPrincessUK: Wow! I am glad you're okay! Remember: a quick pass with a lighter or match will be enough to get the bottom of a candle sticky/melted enough to stick to the top of a honey jar. Just make sure you firmly hold it in place afterwards for 10-20 seconds while the wax cools into place. Good luck to you in the future! You'll want to make sure the whole arrangement is fire-safe, of course. Hello, I purchased your blockbuster herbs and blockbuster oil along with the 9 inch candle as suggested on your web site and followed the instructions to create the candle with the herbs and beeswas then dressed the completed candle with Blockbuster oil then I lit the candle, then I followed the directions with the remaining herbs and prayer paper and poured the water over me as directed. The candle burned fine all night but, this morning, the candle started burning really big and the herbs started burning and the remainder of the candle burned up in about 20 minutes. It left a large puddle of wax. The puddle of wax remains lit and has been burning for app. 3 hours now. I'm wondering if any one can help me figure out the meaning of all this. I burned the Blockbuster candle in hopes to remove all blockages preventing my ex from returning to me. I had hoped it would clear the path so he can come back. Can any one help me figure this out? The remaining puddle of wax continued to burn very small and quietly for 11 hours. Just now, I am in the kitchen and all of a sudden the fire alarm goes off in my house and it's filling up with smoke. I go thru the house to figure out what's going on and I find my Blockbuster Candle remnants literally on fire. The flame was blazing so high and smoking a lot. I grabbed a large towel and threw it on the fire and extinguished it but, it took about 10 minutes to stop the alarms. Thank goodness the candle was in the tub. I put in in there for safety reasons. If I had this candle on my table or altar like I usually do, my house would have burned down. I would surely like to know the meaning of all this. Wow! What an ordeal!! I'm so sorry. Sometimes this will happen if the petition paper is to large, there's too many herbs, or If this spell just didn't work for you. The meaning is not to be determined by a single "rule." My suggestion at this point is to get a reading because maybe you need a cleansing first. Or, if you don't want a reading, you might want to have MISC light a blockbuster candle for you to see if they have problems. This could be an indicator that you simply may have to learn how to prepare the candle improperly. I usually have my clients do a 13 herb bath first (and any necessary uncrossing and/or cleansing spells) before performing a blockbuster spell. This may have been the case for you. I hope that things turn for the better. And glad that you're safe. It happened. I had a fire in my room. I was burning a chime candle on top of the honey jar for the guy I've been working on. It had healing oil to help heal him from past wounds to remove obstacles to our relationship. It caught my robe on fire that was hanging on the door nearby. The thing is, I have burned candles in that exact spot many times before. Also, there was no draft except maybe a bit of movement from the heater. The battery on my smoke alarm was dead and I was in the kitchen so by the time I smelled it, a lot of damage had been done. I'm so bummed. I know it's probably just my own damn fault and if it is spiritual, it's a sign that the relationship is doomed. But I guess I just wanted to share as a cautionary tale. Make sure your candle isn't anywhere near cloth of any kind and don't leave standing candles unattended because you never know what forces, natural or supernatural, might make the flame rise or bend. So very happy that you're OK (that's all that really matters).